Hurricane Nicole has hit Bermuda, tearing roofs from buildings and uprooting trees, before moving out into the Atlantic Ocean. It had weakened from a Category 4 to a Category 3 storm, but still had maximum sustained winds of more than 125mph. Teams are out clearing roads and repairing buildings and power lines. Last week Hurricane Matthew devastated parts of Haiti, killing hundreds of people. 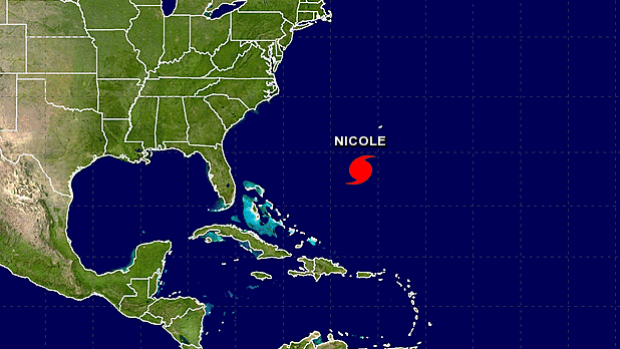 “Nicole is now racing away,” said James Dodgson, deputy director at the Bermuda Weather Service. Although the impact of Hurricane Nicole was less than feared, there has been some damage to the island’s infrastructure, daily newspaper The Royal Gazette reported. Some walls and roads had collapsed, it said, and some boats had been smashed. Schools and government offices in Bermuda were closed on October 13 and airlines canceled flights as Hurricane Nicole approached.